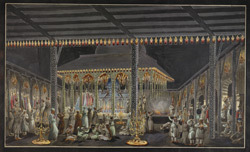 Watercolour depicting the scene in the Imambara at the height of the Muharram Festival, by an anonymous artist working in the Murshidabad style, c. 1790 - 1800. The Muharram festival commemorates the popular saint Imam Husain, the Prophet Muhammad’s grandson and the spiritual leader of the Shias who was martyred in 680 AD after a battle in Karbala. The festival starts on the 1st day of Muharram, the first month of the Islamic calendar, and lasts for 10 days. It is celebrated with lavishly decorated tazivas (bamboo and paper replicas of the martyr’s tomb) which are often carried through the streets of the city. Mourners beat their breasts accompanied by musicians, dancers and wrestlers who enact scenes depicting the battle. In this drawing, the tazivas and standards in the central domed pavilion are illuminated by lamps and a fire. Surrounding the pavilion in the courtyard are many figures reinacting the battle.